Town Hall Symphony Hall welcome Amsterdam-based trio Tin Men and the Telephone to Eastside Jazz Club this Thursday 7 February where they will incorporate electronics, projected visuals and audience participation into a live performance like no other. The trio return to the Royal Birmingham Conservatoire and its atmospheric jazz club after a short residency there at the end of last year. During the week they spent there, they worked on their various apps, did a BBC Radio 3 broadcast and three sharing sessions. This Thursday 7th February they return to do a full show. This dynamic trio is led by Tony Roe, with Pat Cleaver on bass and Bobby Petrov on drums. Through the use of ground-breaking technology they encourage their audience members to participate through the Tin Men app which allows them to create melodies, rhythms and harmonic sequences. This interactive experience even opens the floor to comments on world leaders and other topics chosen by the band. The trio's impressive ability to improvise and respond to audience participation has often been likened to an audience member's experience at a comedy show where shouting out suggestions is encouraged, and can often influence the activity on stage. Due to the nature of this multi-faceted interactive show, each gig experience is unique - with pieces ranging from the tongue-in-cheek and a zany humour to jaw-dropping musicianship and moments of wonder. 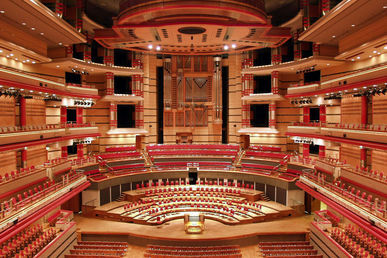 The Birmingham residency and this gig is part of a series of residencies in the UK with the Birmingham activity created in partnership between the Royal Birmingham Conservatoire and Town Hall Symphony Hall's Jazzlines Programme.